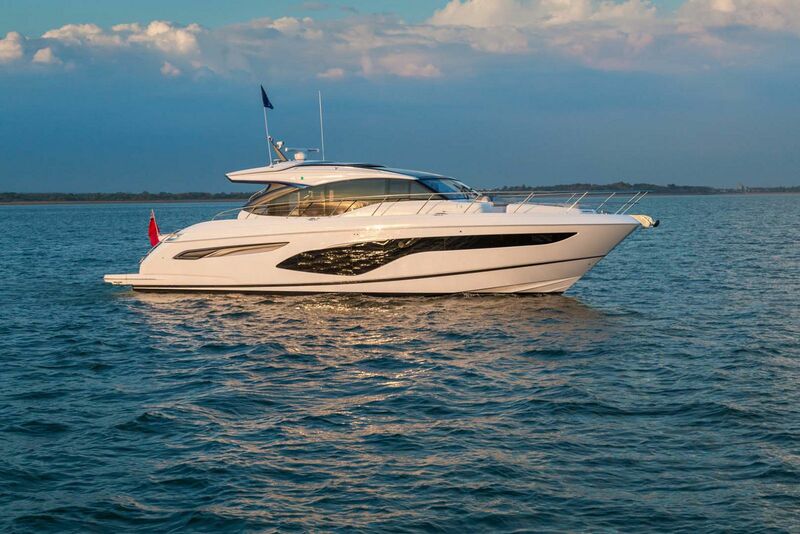 Princess is continuing to expand its V-Series express yachts as they grow in popularity. 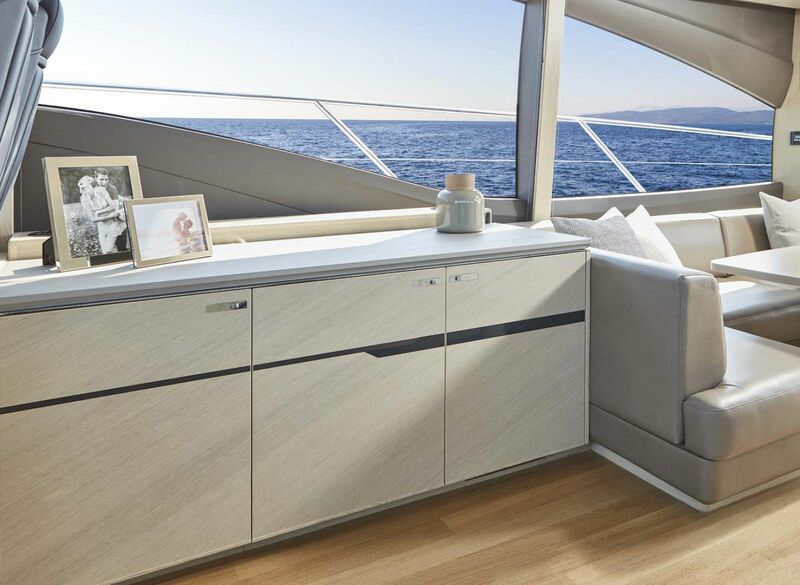 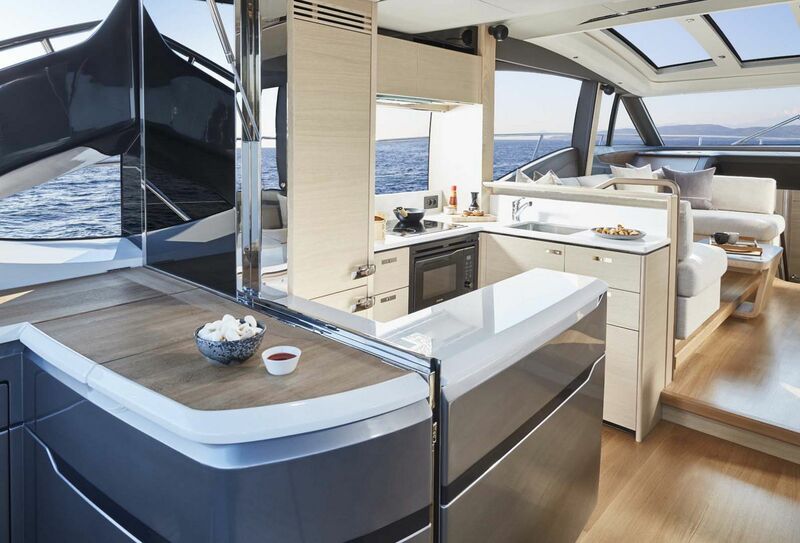 Owners like the space that comes from the resin-infused structure in the interior of the yacht combined with the performance and stability that the unique deep-V hull design provides. 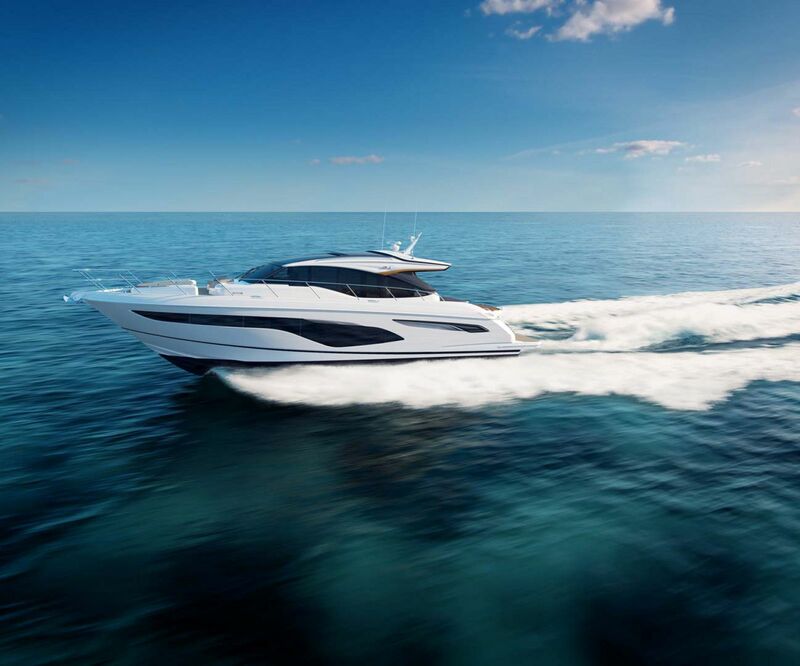 The new Princess Yachts V60 will debut in the Spring of 2018. 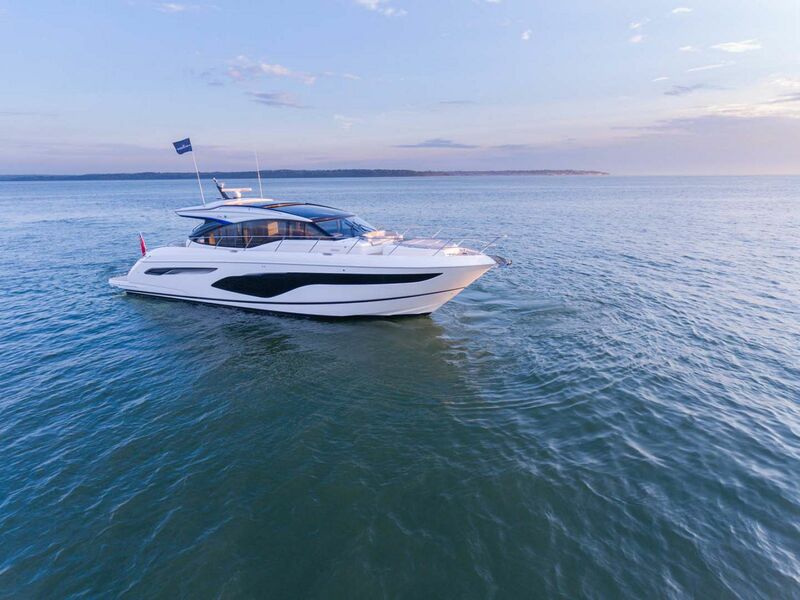 Aside from the hull shape and sleek exterior styling that the later Princess models are starting to sport, the V60 has many of the same attributes as its larger sibling, the V65. The interior begins with an aft galley with a power window that opens up to the aft cockpit area. 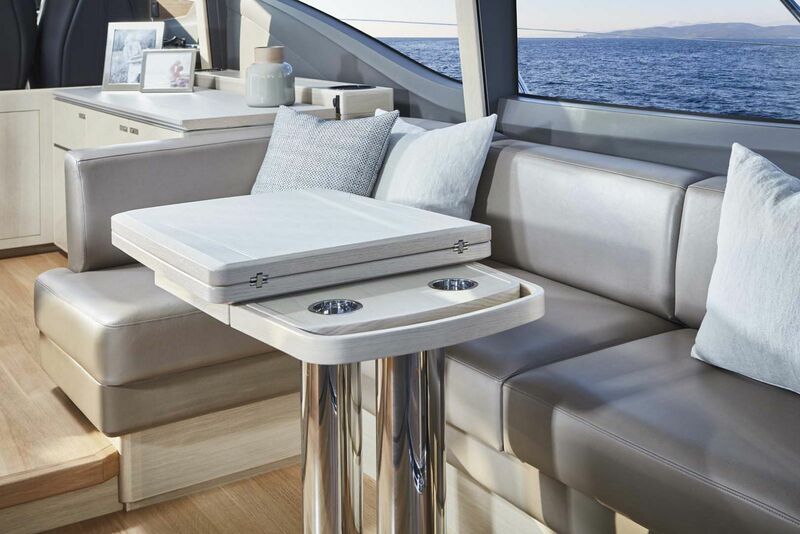 This really opens up the boat and allows anyone cooking to easily serve food and cocktails to anyone dining outside. 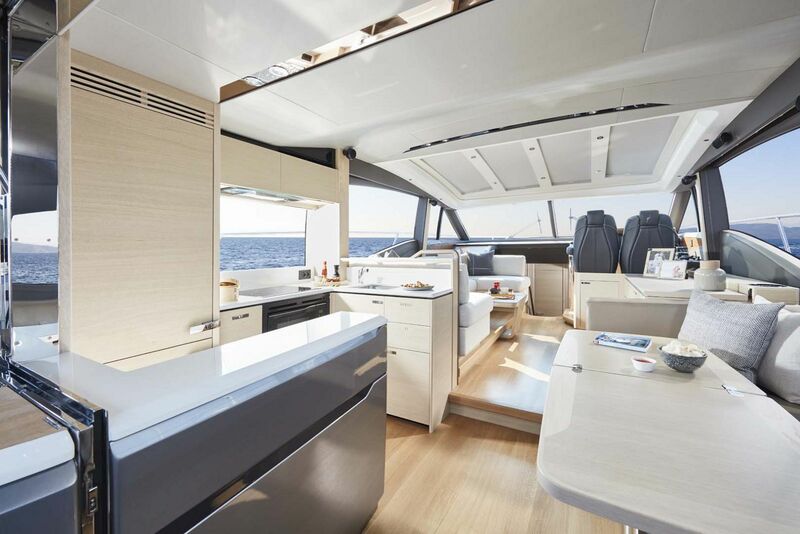 Keeping in line with bringing the outdoors inside the V60, it also features a retractable, electric sunroof in the salon that lets in the air and sunlight. 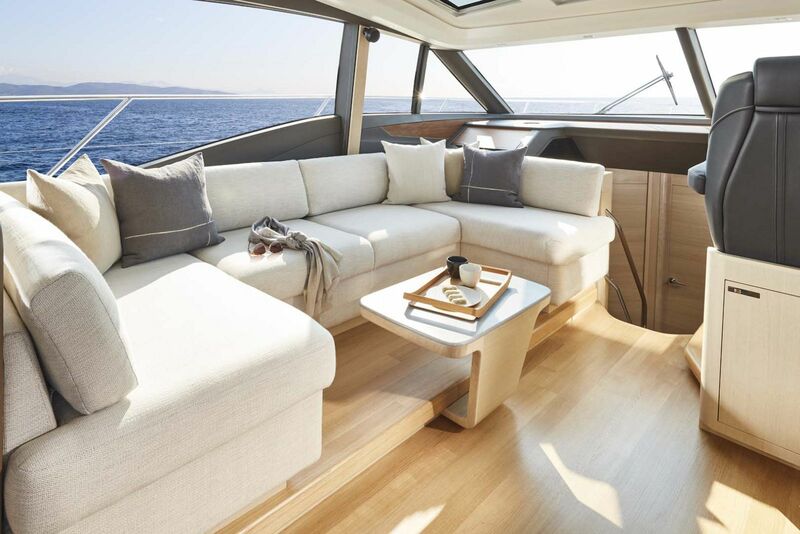 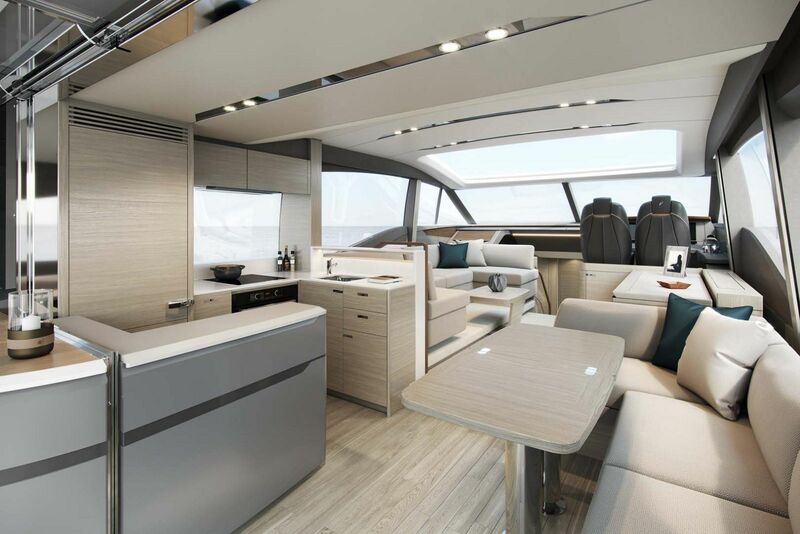 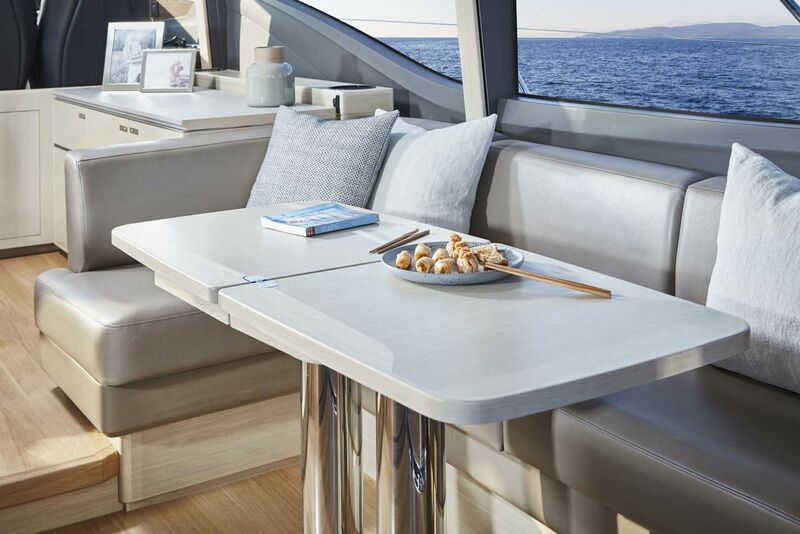 There are plenty of places to sit and enjoy the scenery inside including a U-shaped sofa near the helm and a L-shaped sofa with folding dining table near the galley. 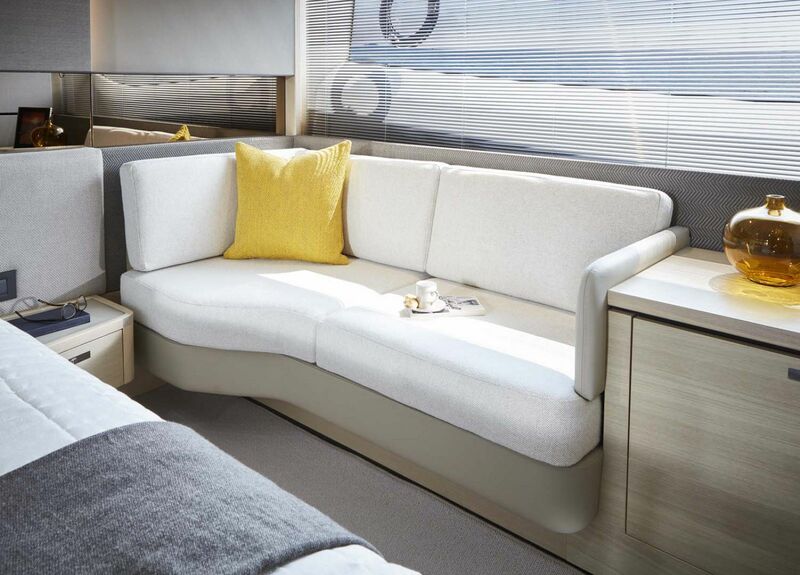 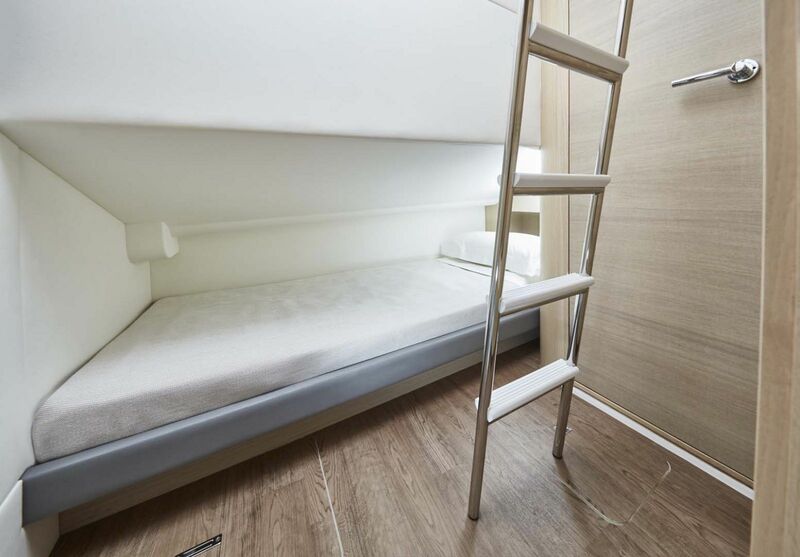 The V60 has accommodations on board for up to 6 people in three cabins and an additional single crew quarters. 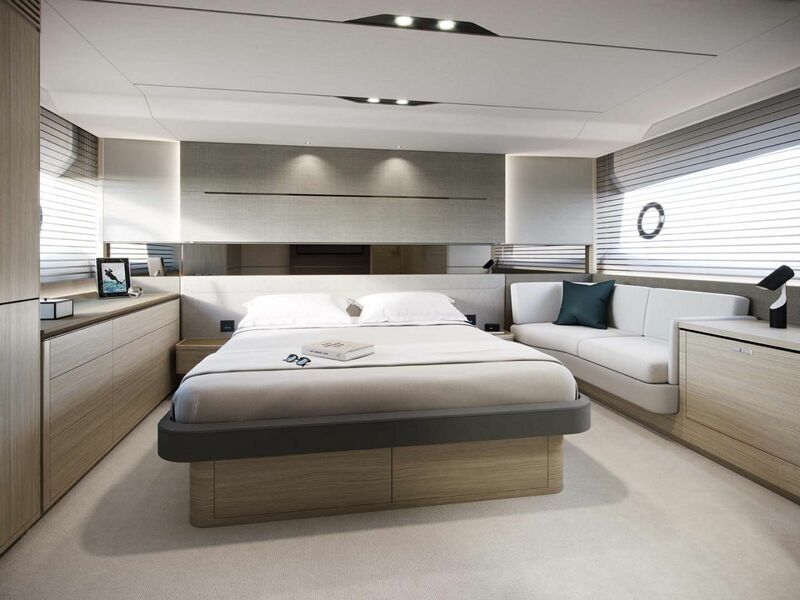 The master suite features an island berth and sofa with lots of storage. 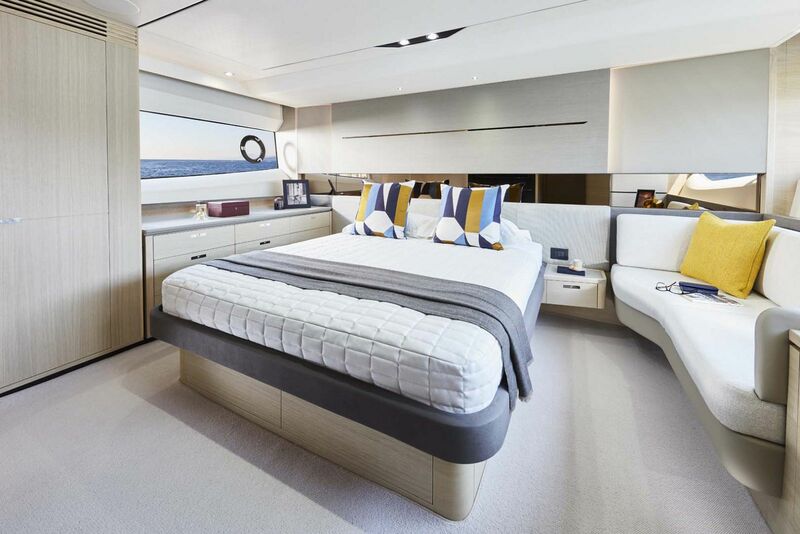 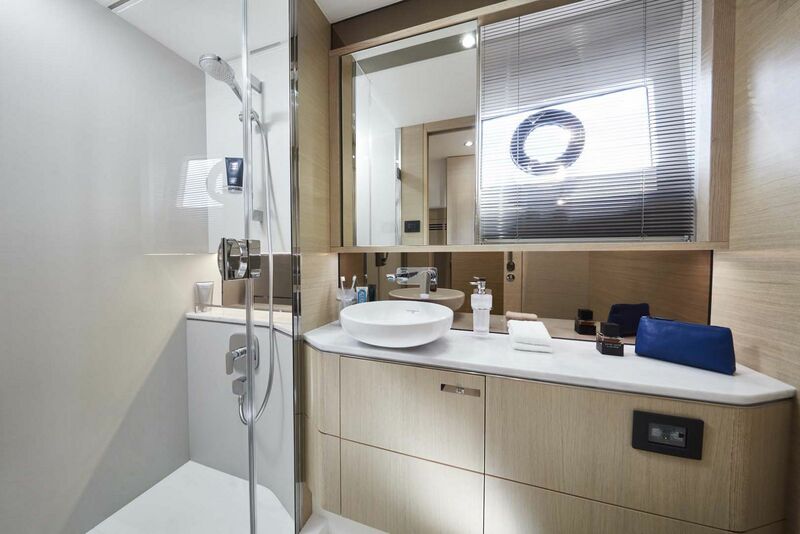 Oversized windows light up the main cabin and there is an en suite head with additional storage. 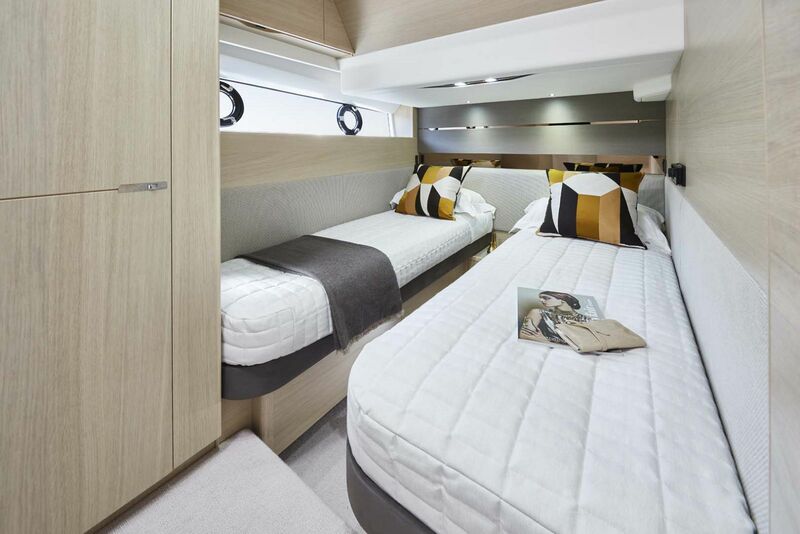 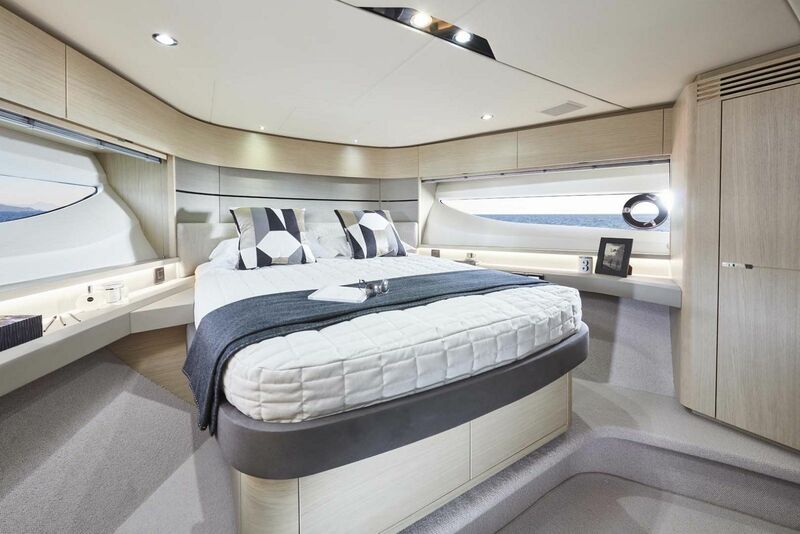 A forward double cabin and starboard twin cabin with optional electric sliding bunks share the forward en suite and give guests on board plenty of privacy. 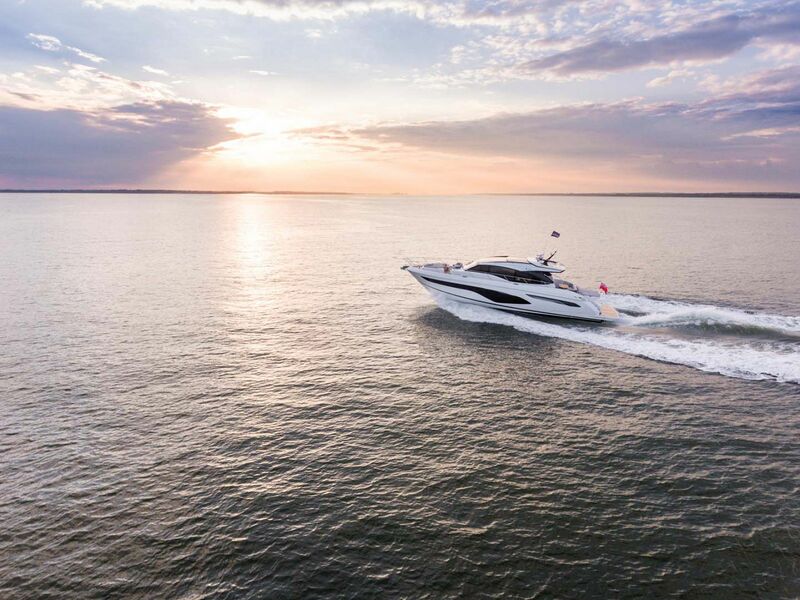 Princess has chosen twin MAN V8 1200hp diesel engines as the power option as well as given her a 715 gallon fuel capacity. 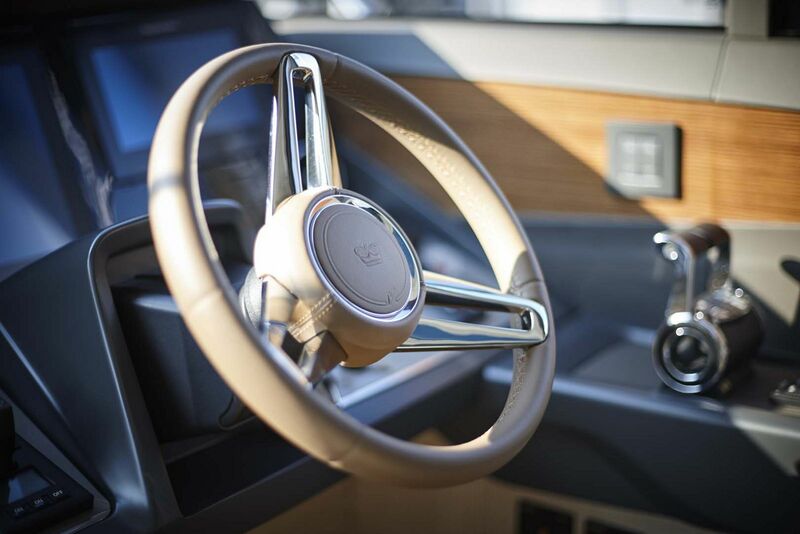 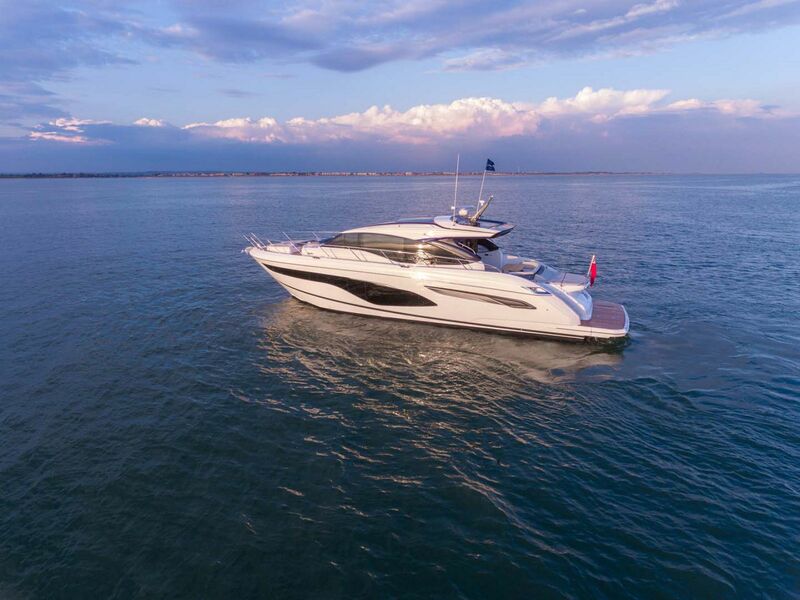 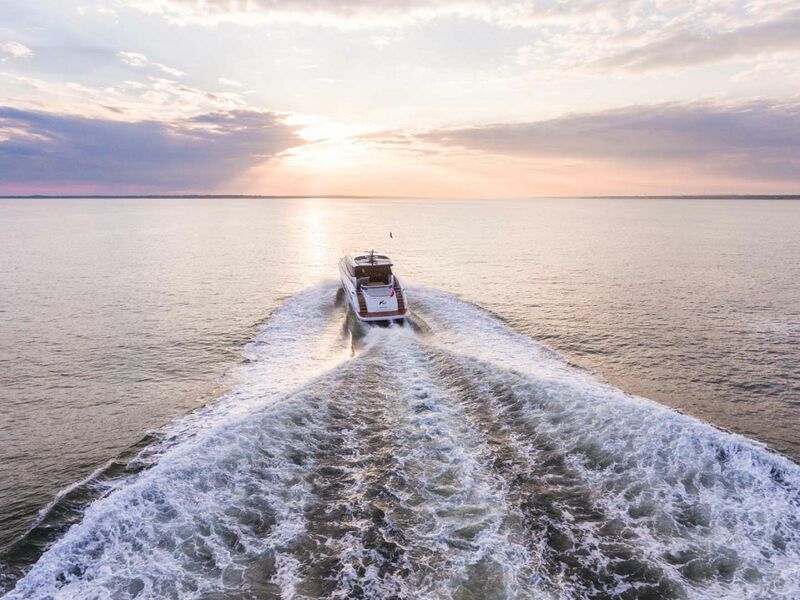 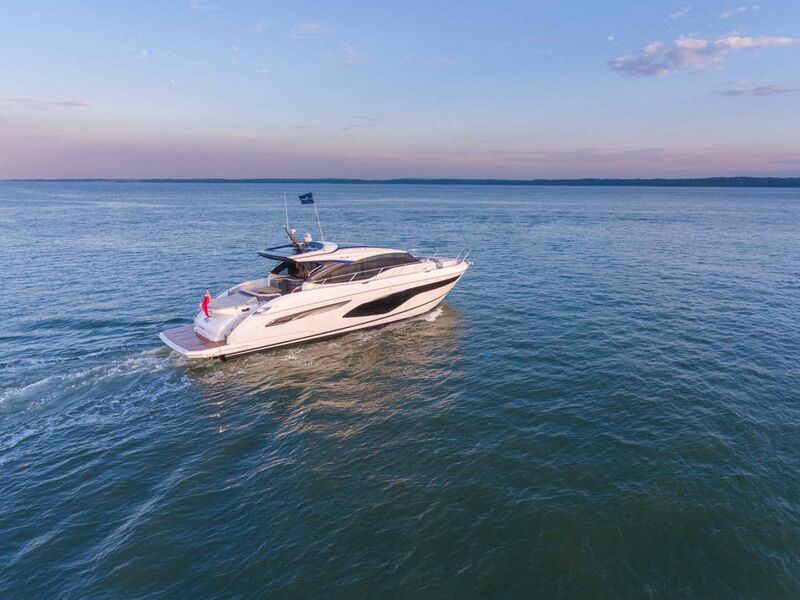 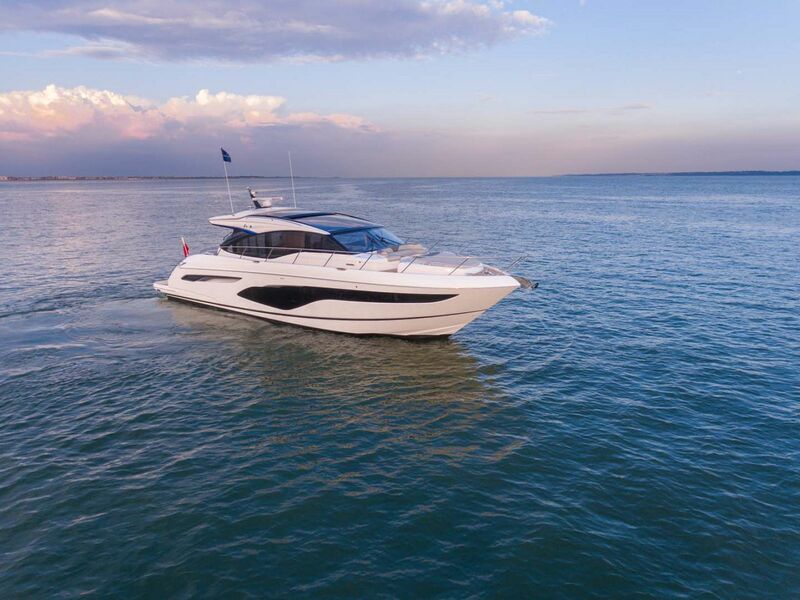 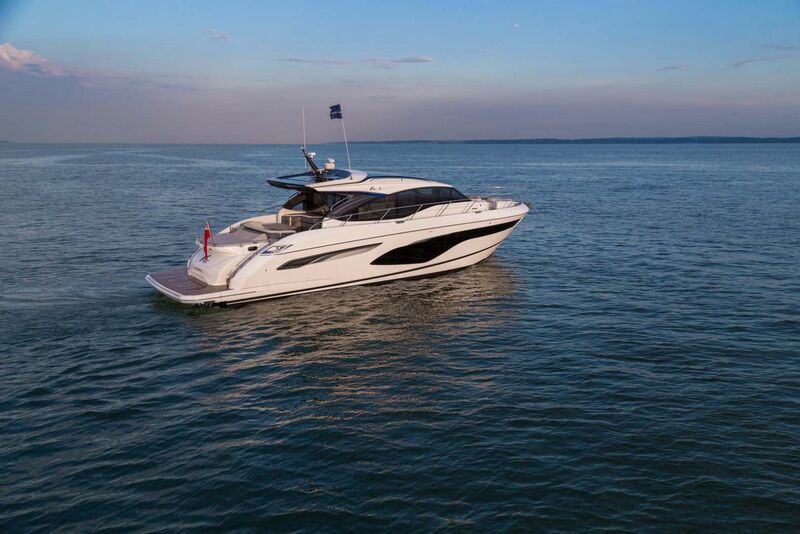 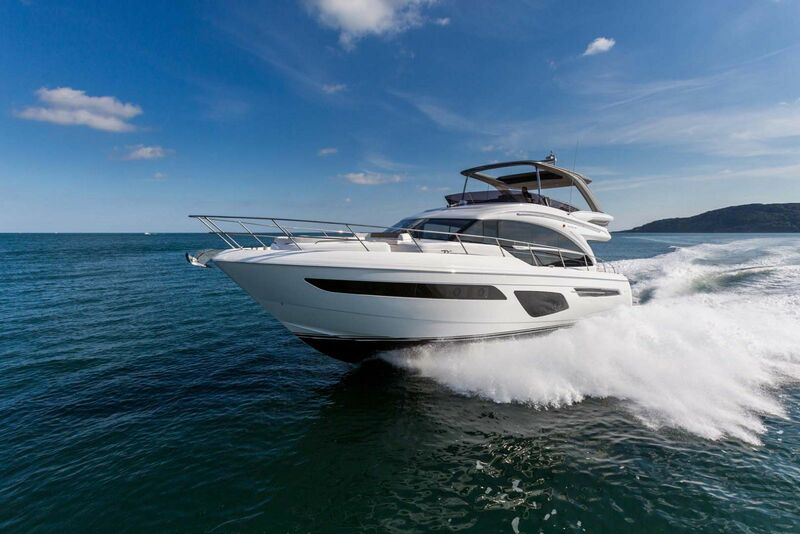 For more information on the new Princess Yachts V60, contact your Staten Island Yacht Sales professional today. 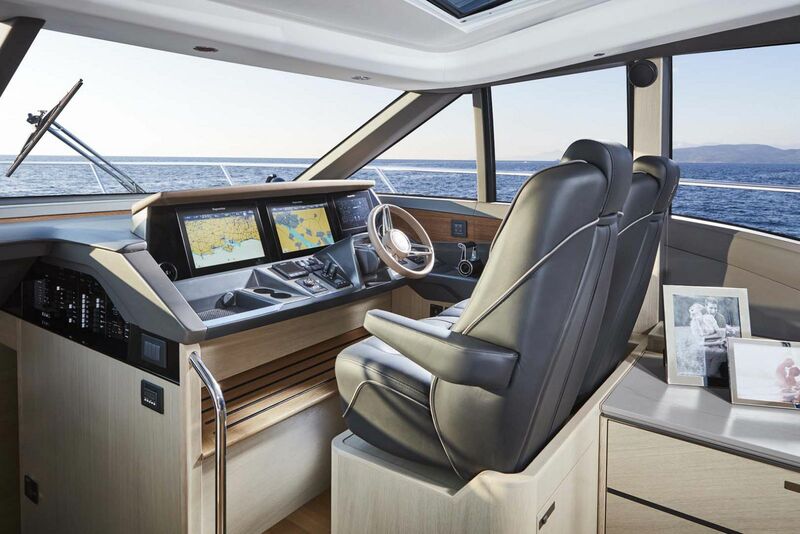 With a dynamic yet agile look, Princess V60 is the latest addition to the V Class range, featuring good performance and safe sea-keeping ability. 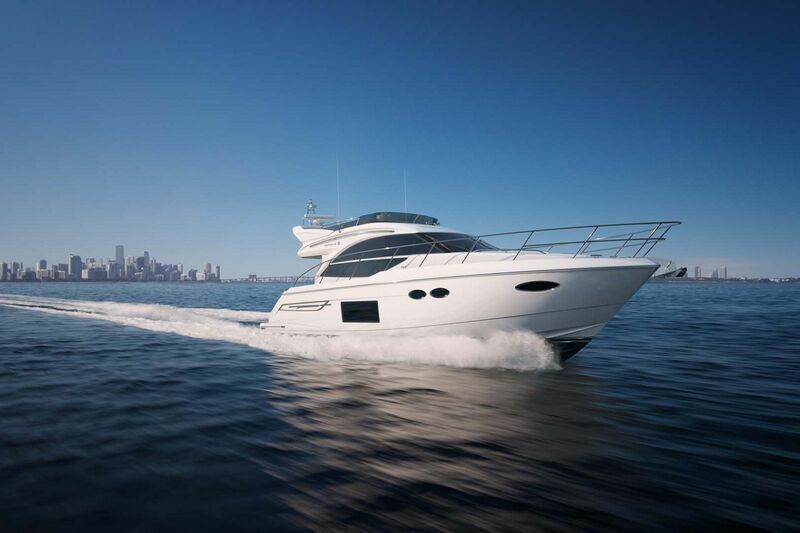 It can reach a top speed of 38 knots.